This is my 1st 1,000 milestone to my blog slightly more than 2 weeks. It is really not easy to keep the it alive with interesting topics. From the statistics collected from Google Analytics, people are more interested to know where to get limited and rare collections. 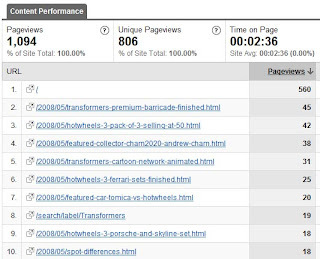 For instance, my publishes on transformers Barricade and Hotwheels 3 won most of the clicks. As for the geographical location, 80% of the visitors are from Malaysia, followed by 10% Singapore, 2% US, 2% Australia and 6% to rest of the countries. 58% of visitors are referral from Lowyat forum.